A De-multiplexer (De-Mux) can be described as a combinational circuit that performs the reverse operation of a Multiplexer. 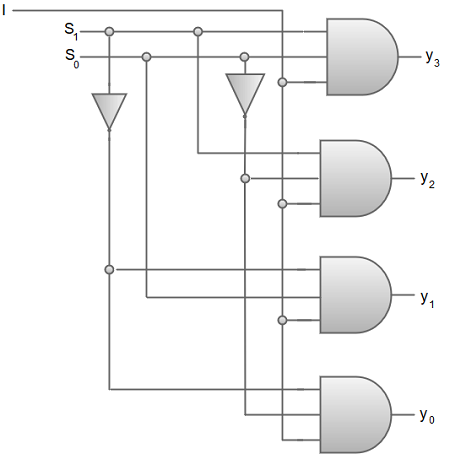 A De-multiplexer has a single input, 'n' selection lines and a maximum of 2^n outputs. 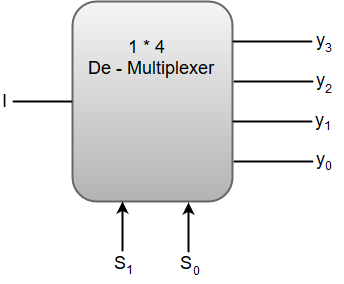 The following image shows the block diagram of a 1 * 4 De-multiplexer. The above equations can be implemented using inverters and three-input AND gates. 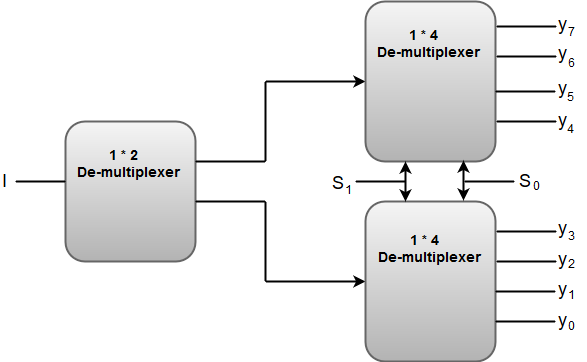 We can also implement higher order De-multiplexers using lower order De-multiplexers. For instance, let us implement a 1 * 8 De-multiplexer using 1 * 2 De-multiplexer in the first stage followed by two 1 * 4 De-multiplexers in the second stage. The Selection lines 'S1' and 'S0' are common for both of the 1 * 4 De-multiplexers.